Step Two: Take the largest flower shaping ball tool and mold on the back of each of the largest petals. 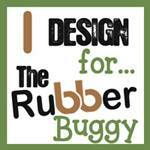 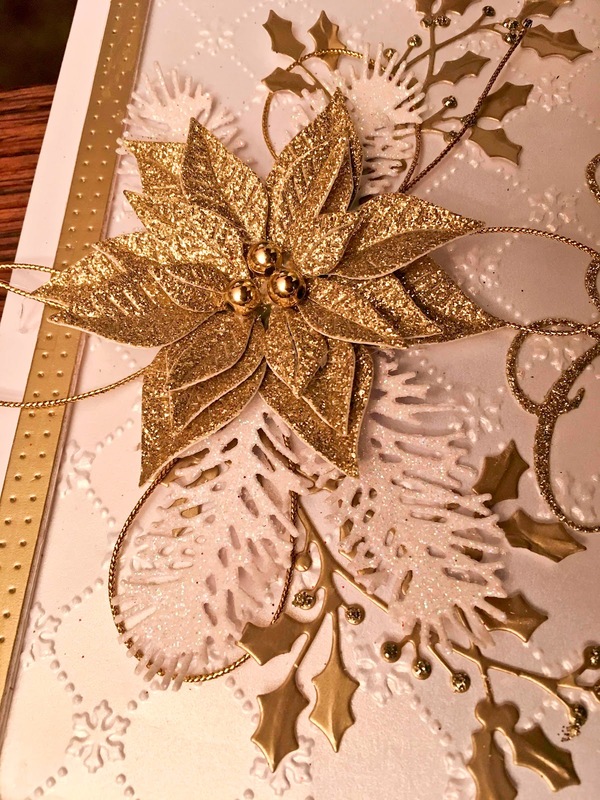 If you use a smaller molding ball, it tears through the cracks of the die cut. 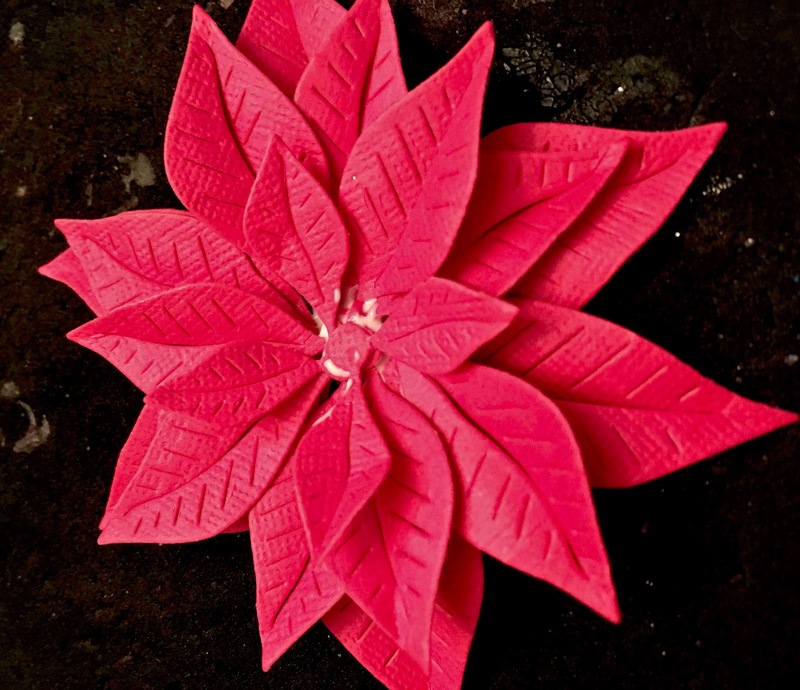 Step Three: Turn the flower to the front and fold in the center of each petal and pitch each end of the petals. Glue the center of the petal sets together to start forming the poinsettia. 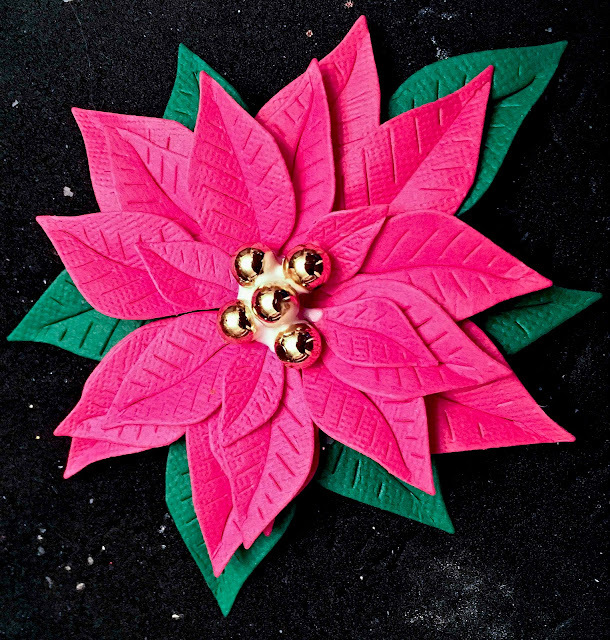 If you want to sponge parts of the flower, do this before gluing the layers. 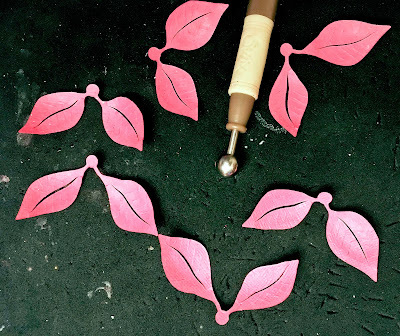 Step Four: Take the second to the largest petals with six sets and repeat the above instructions and still continue to use the largest flower shaping ball. Turn the petal set to the front and fold in the center of each petal and pitch the ends of each petal. 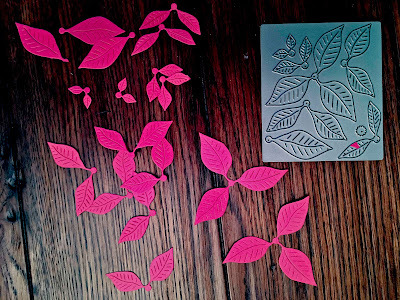 Step Five: Glue two sets together as seen below. 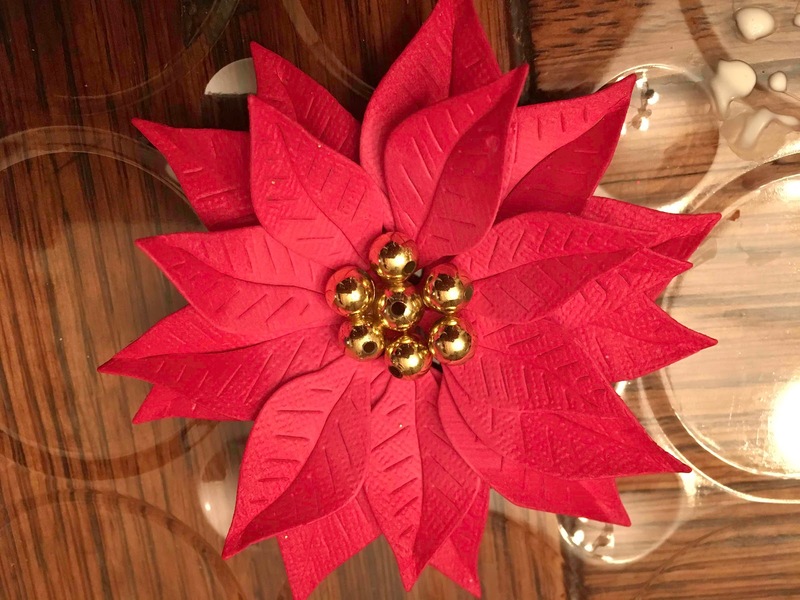 Step Six: Glue these three sets to the center of the flower in a circular arrangement. 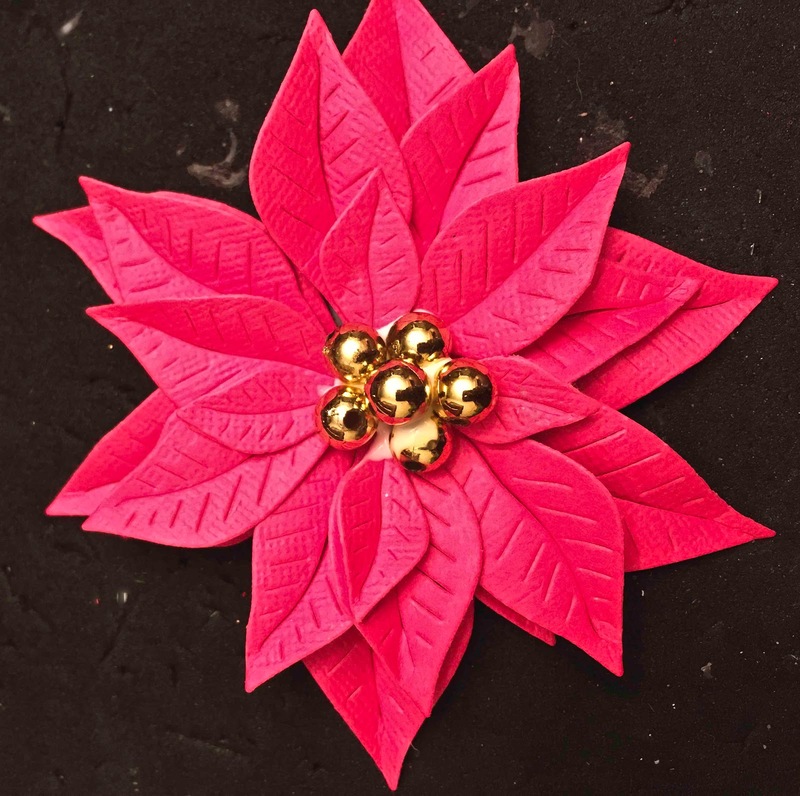 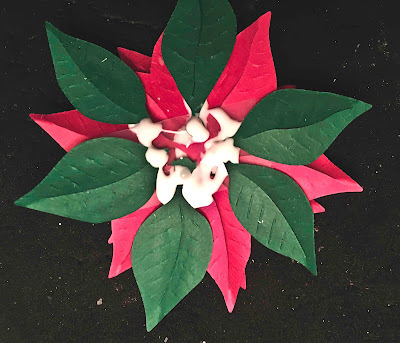 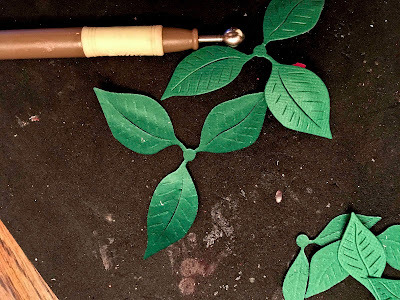 Step Seven: If you want a fuller poinsettia, use the rest of the smaller petals starting with the third largest down to the smallest and glue to the flower. 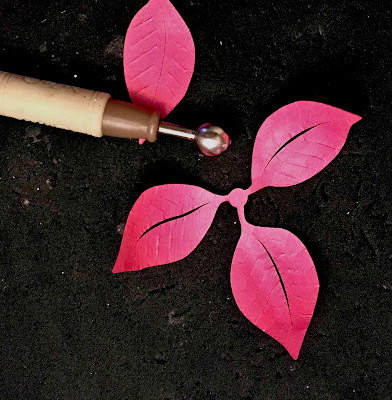 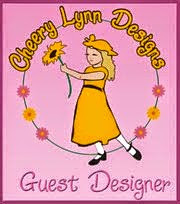 You will still want to mold the petals and pitch the ends of each petal. Step Eight: Glue the center with beads or anything you want. Step Nine: Cut out two sets of the Frantic Stamper Poinsettia die with green cardstock. Shape the leaves just like the poinsettia. Note: Leaves are showing behind the poinsettia. 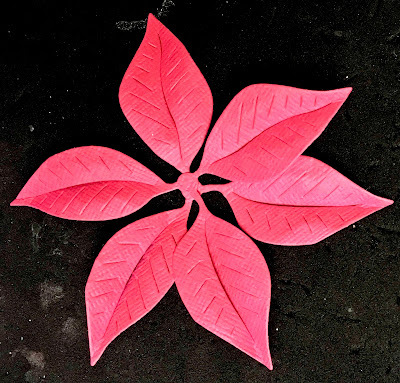 Glue beads or floral stamens in the center of the flowers. The Frantic Stamper die set also comes with a stamen that could be used for this flower. 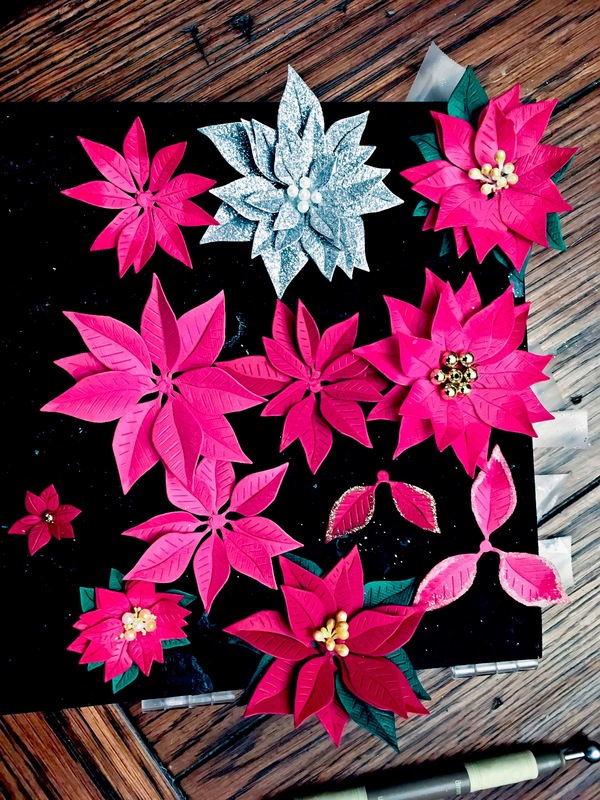 Note the above photo the different sizes and centers for each poinsettia. 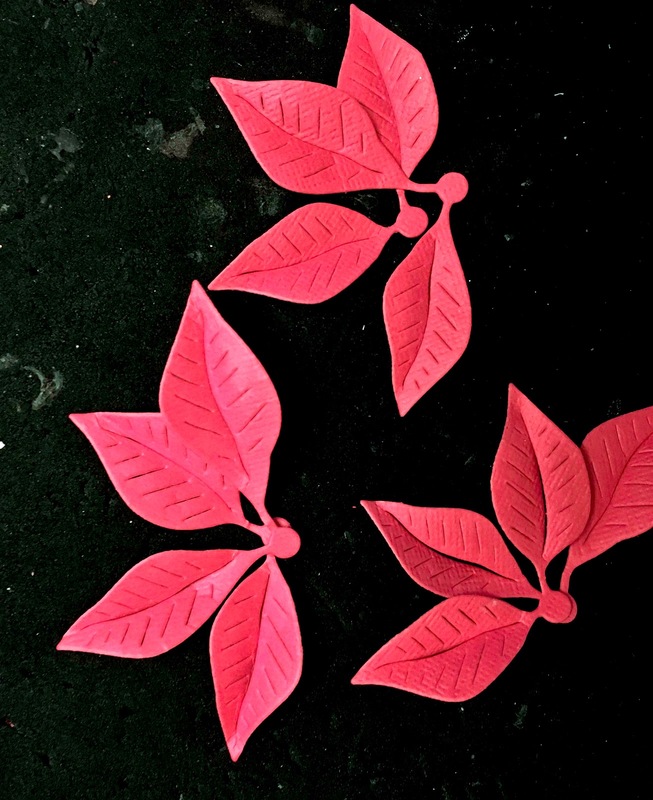 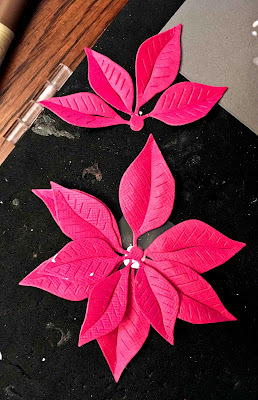 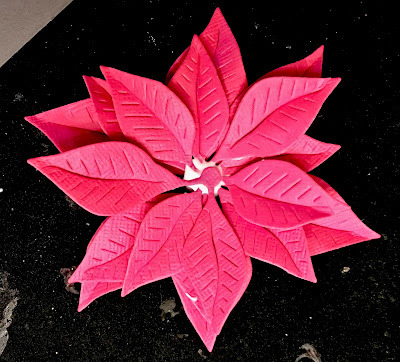 The pink poinsettias were sponged with dark pink ink. I added glitter to some petals but didn't put poinsettia together with glittered petals. 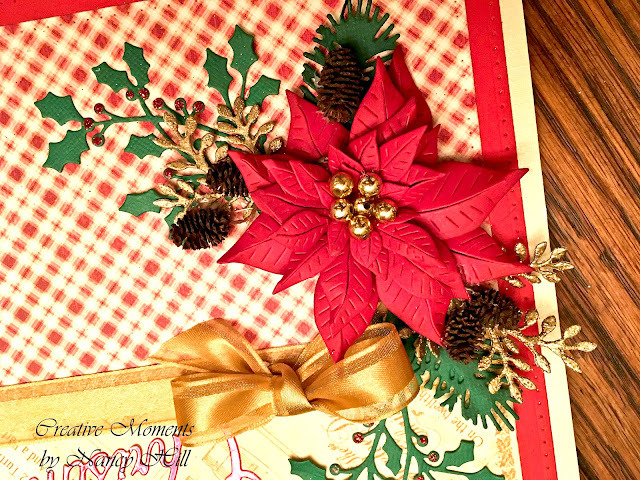 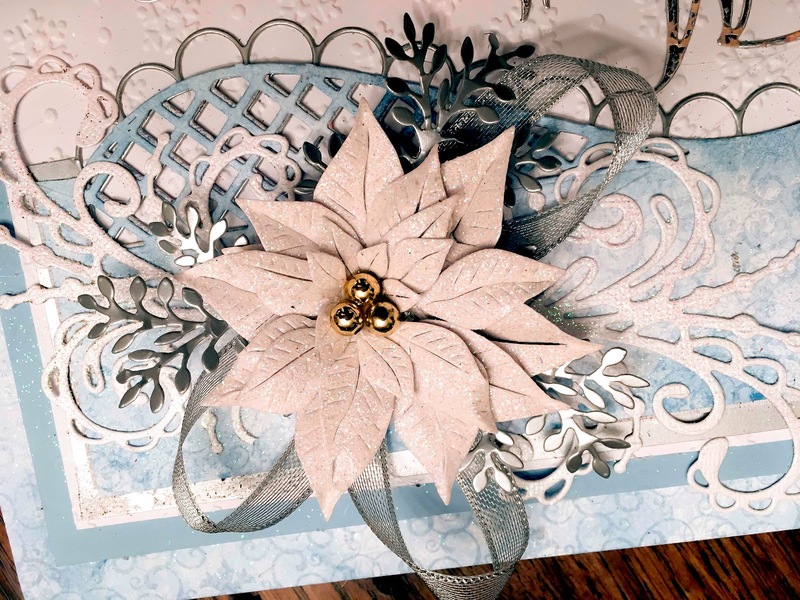 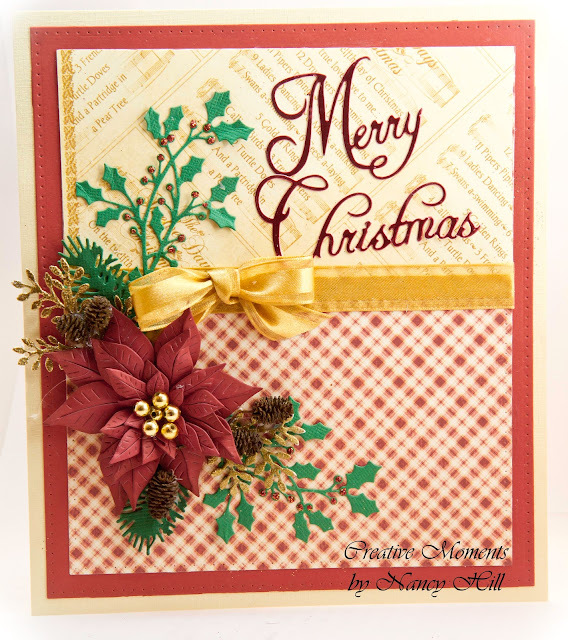 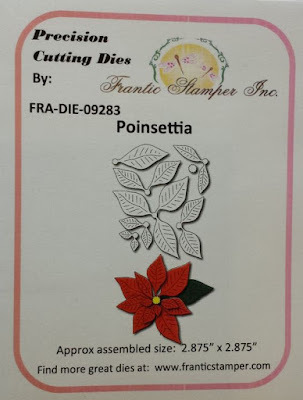 Now is your turn to use your imagination and creativity to design your own poinsettias with the Frantic Stamper Poinsettia die set from Frantic Stamper on-line store.